The cartoon on the left was done a few years ago, and was originally titled Alien Influences on Civilization #1: Zen Buddhism (it was meant to be the first in a series, but I couldn't think of any others)! 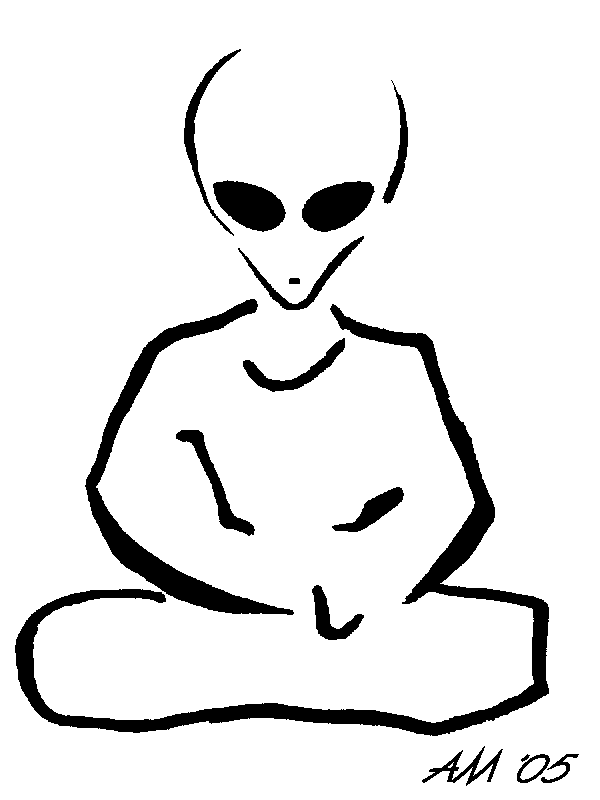 Apropos of Zen Buddhism, Paul Jackson sent me the following quote from Bob Rickard, taken from the same early issue of Fortean Times mentioned in a previous post: "We note obvious points of contact between the Fortean view of the Universe, Zen and indeed the subconscious processes of mind (even Cosmic Mind). 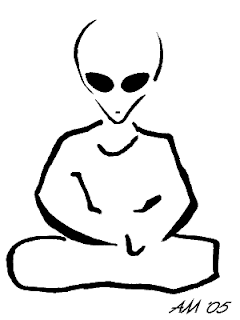 We would like to see this whole area explored more..."
I'm not sure what Bob Rickard meant by this, but it did start me thinking about possible parallels between the Fortean approach to reality and that of Zen. One thing they have in common is that both are fundamentally distrustful of authority... another is that both view empirical facts as the only valid measure of reality. The difference, of course, is in the context. Fort's great adversary was the scientific establishment, with its insistence on excluding all data inconsistent with whatever theoretical framework is currently fashionable. Zen, on the other hand, is a religious practice... but one which shuns rigid beliefs and "book learning" in favour of direct experience of reality. Despite the obvious differences the parallels are striking nonetheless, and may explain why many people (in the West at least) who are interested in Zen are also interested in Forteana, and vice versa. Bookshop proprietors seem to be well aware of this, since the two topics are often found on the same shelf! My blog has more details on Zen from Ch'an and full lotus paranormal qigong from http://springforestqigong.com -- check out the testimonial vids and Mayo Clinic research, etc.